A happy statue of a Budda, sitting among piles of gold coins, along with golden temples, dragons and tortoises, all combine to give the Big Fortune pokie an opulent appearance that’s bound to draw in players at the many casinos which carry games from the Australian developer Aristocrats’ range. It comes complete with wild substitutions for extra winning spins, a free spins game where the payouts get bigger and bigger as it progresses, and the Reel Power format that does away with conventional paylines altogether, plus it’s got the signature style and promise of fair play that comes with all games from this popular developer. On top of all this, the Oriental theme is quite possibly the most popular topic for pokies to stick to and a real speciality of the company, so success is pretty well guaranteed. The first thing to notice about Big Fortune is that it uses the Reel Power system, which simply means that winning combinations come from seeing 3, 4 or 5 of the same symbol in any positions on adjacent reels, although the line needs to start from the reel on the left side. There’s 243 different ways that this can happen, so it makes this a low volatility pokie which should pay out lots of smaller wins, rather than just a few bigger ones, which suits the majority of people who don’t want to sit there endlessly feeding money into a game without any returns. Smaller wins come from the playing card symbols 9, 10, J, Q, K and A, which are standard across most pokies and while they may be seen as just fillers, at least players can expect to see them creating plenty of prize-winning lines. Of more interest are the picture icons, which mostly consist of golden statues. These are presented in high quality graphics and really add to the visual appeal of Big Fortune. In increasing order of value, we have a snake and golden ingot, both of which have maximum returns of 200 coins, a tortoise and warrior, each of which is worth up to 500 coins, and the richest standard symbol is the dragon that will treat players to an impressive win of 1,250 coins when it stops across all 5 reels. Our friendly Budda can land anywhere on the middle 3 reels and if possible, he will substitute for any other standard symbol and complete a winning line, or turn a row of just 3 matching symbols into a row of 4 for an enhanced payout. It’s even possible for him to complete multiple lines at once, as there’s no defined paylines here, so any symbols on adjacent reels could potentially become a winning combination if the wild is in the right place. An image of Chinese-style arches, perhaps from a temple, works as a scatter symbol, so it can land anywhere on the reels and as long as 3, 4 or 5 appear at once, players win a prize equal to 75, 250 or 500 coins respectively. It also provides entry to a free spins bonus game and although only 7 spins are credited, there’s the potential to get some great rewards during this brief round. If players land a winning combination on the first spin, they get a standard payout, but if they get a win on the second, the amount will be doubled in value, and if the third spin sees a prize paid out, it will be triple the base value. This goes on throughout the round, so landing a win on the last spin will be worth a prize 7x the amount that it would be in the main part of the game. If 3 scatters land at once during the free spins, an additional round will start as soon as the current one ends, but this time around the multiplier can go all the way up to 10x. 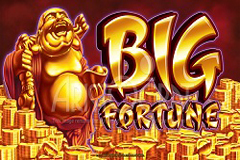 The Big Fortune pokie may not carry any progressive jackpot prize which would really justify the name, but there’s enough winning potential in the free spins game to make it a very appropriate title. Even in the main run of play, there’s some great wins to be had, thanks mainly to the Reel Power system, while a popular theme and pleasing style should ensure that players will enjoy their time at this game. Like all Aristocrat pokies, the ratio of risk to reward is high, so no-one has to spend a big fortune on it before getting some decent returns on their wagers, and once the wins start coming in, they could land a small fortune, if not a huge one.